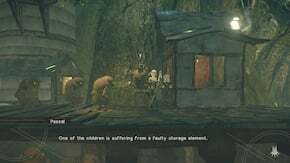 Storage Element is a Side Quest in NieR: Automata. "According to Pascal, a child in the village has fallen ill, and may not survive if you don't help her." "Go to the abandoned factory and collect the needed part." "Pascal happily accepted the storage element. He clearly cares for the children vry much, but to you, the reward is all that matters." This quest unlocks on your third playthrough, as you play as A2. You must have completed the Maintenance quest. Talk to Pascal, and he will ask you to go to the Abandoned Factory to obtain a Storage Element. Head to Factory: Entrance and go inside and proceed normally (do not go down the elevator; go up the ladder instead) until you reach the portion with some open storage containers, top-down view, and many enemies attacking you in a small rectangle. Return to Pascal to complete the quest.